“I am a K9 officer and my dog Johnny has been going through a rough bout of diarrhea with blood and loosing a very large amount of weight. 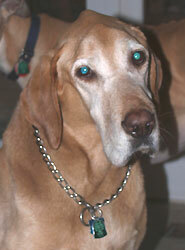 He spent several nights in the Doggy ER with lethargy, dehydration and bloody diarrhea. “Beautiful Gabriel was diagnosed in the fall of 2008 with a tumor on his lung. I immediately got on the internet and researched what could be done to help him as it wasn’t something operable. I came across K9 Medicinals and was impressed with the website and figured what the heck may as well try it. My veterinarians did not discourage me either and medicines had no side effects on him…he was happy for the extra cream cheese that was wrapped around his pills! I ordered recommended K9 Immunity, K9 Transfer Factor and K9 Omega pills and switched him to a high protein diet dry dog food. 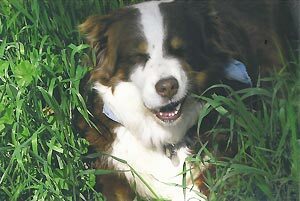 “My dog Chester became strangely ill on August 17th, 2005. He stopped eating, now for Chester not to eat was a problem, but I thought maybe an upset stomach, maybe he wants my food, maybe, and then he collapsed. I rushed him to the animal hospital and was not ever in a million years prepared to hear what I heard, and to this day it still resonates in my head. 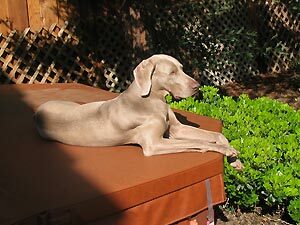 ‘Your dog has advanced liver cancer that has also entered his lymph nodes. He has two weeks to live, maybe less.’ I honestly thought they were joking, two weeks, but he is only 9 years old, he was fine just three days ago. You’re wrong I thought, you made a mistake. They gave me medicine to ease any pain he may be in and sent me home with my two weeks. Wait a minute I thought, this is an animal hospital on a Sunday, not my regular vet. My vet would tell me this hospital is crazy, or the doctor does not know how to read the tests. Yeah that’s what will happen. Monday came and that’s not what happened, he had cancer, and in the liver and lymph nodes as the hospital stated. Two weeks maybe at the most. At this point I had a choice, let him die or become proactive. So I went web hunting, typed in liver cancer and dogs and lymph nodes (Up until this point I had no idea what a lymph node was) Things did not look good, bleak actually, and then at 3 AM in the morning I typed in ‘help my dog has cancer’ and it lead me to a bunch of sites that people talk about their dogs and cancer. A bunch of people talked about something called K9 Immunity and how it helped with cancer. Now I was desperate and skeptical at the same time, so I went to the web site to check this product out. After reading the site and what people said about what it does, and the honest fact that I would do anything to make him better, I ordered K9 Immunity. Next day delivery of course. That day gave me four more years with Chester. To my vet’s surprise and mine he became himself again, he played again, he ate and ate and ate again. I did change his diet that was more cancer unfriendly, had his blood work done every 4 months and my vet added URSO to help his liver do its job better. 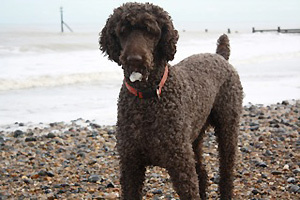 Chester lived a full and happy life up until the age of 13.2 years. I was not ready for “two weeks”, but never was happier to be given 4 years. 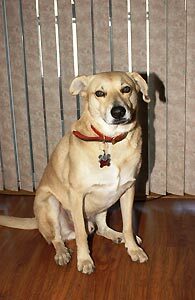 “Miracle Milo: We adopted Milo, a lab Shepherd mix from a rescue group on 1/30/2006. 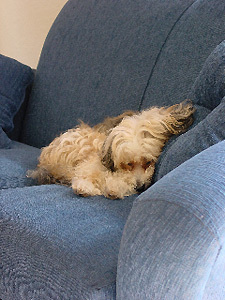 On 9/9/2010 Milo started limping so we had him checked out by a vet. It turned out that he had osteosacroma in his left leg. Our choices were amputation and chemo which we could not afford, so we searched the internet and found K9 Immunity and K9 Transfer Factor. We decided to try it. Our miracle boy has been taking 6 K9 Immunity and one Transfer Factor daily. We have now had him for 4 years and he is almost at his 5 month mark of surviving with cancer. 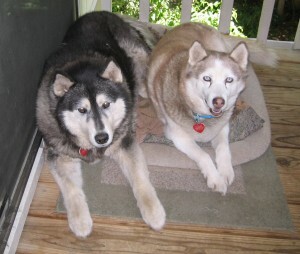 “When the vet told us that our sweet doggie Kenai had Lymphoma we were so so sad. We couldn’t imagine life without our big fluffy boy. Since Kenai is 13 we decided against chemo and the steroids the vet prescribed were very hard on his body and gave him seizures. Then we decided to try the K9 Immunity products and he went from barely moving around to getting up and playing with his sister Pickles in just a week. He really has become more active and more happy now that he is off the steroids and on the vitamins. 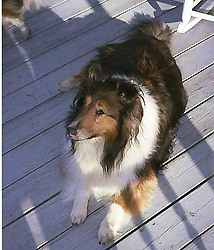 “Our eight year old Sheltie, Shadow, was diagnosed with cancer last August ( 2007). His was a nasal cancer for which the veterinarian gave us only the chemo and radiation options. Not being willing to subject him to a painful process in a distant city, for which there was little guarantee of cure, I turned to the internet and found your website. It was like finding an oasis in the desert. I ordered the K9 Immunity, K9 Transfer Factor and K9 Omega and kept him on it through the fall and winter. In December, we found an oncologist who said he felt he could operate on Shadow and remove the cancer. We agreed to the operation, and Shadow came home on Christmas Eve, making this a happy Christmas for all of us. So far Shadow is progressing well, has his old spark back, and hopefully, will be with us for a few more years. “Jenna was diagnosed with breast cancer in November. Having gone through too much loss, I dug in my heals vowing that I would not lose her. I did a ton of research. My vet wanted to do chemo, I said no. I found K9 Medicinals and along with a lot of other supplements. Jenna has had 3 clean check ups… no cancer. She also gets an all raw diet. My vet is astonished and gives my number to many of his clients. “By the time Junior was diagnosed on August 3 (?) he had already lost 16 pounds in a relatively short period of time. That week, we put him on K9 Medicinals. Two months later when we weighed him again he had not lost any more weight. Since then he has only lost a total of 4 pounds including the weight he lost due to not eating for 3 days because of his surgery. So his weight loss has greatly slowed if not stopped. The other thing is that the vet saw his liver in person when he opened him up for surgery. He told us it’s in very bad condition. When we went to get the stitches out, he asked us how Junior was doing and he was surprised to hear he’s pretty much back to normal, eating well, walking in the woods, going for daily car rides, strolling around the yard, barking when someone comes to the door, going up and down the stairs, and even playful. (Yesterday he even played a little tug of war). He never was very active to begin with and of course he’s slowing down with age since he’s over 12 now. But he’s doing pretty much everything he ever did that was normal for him. He’s feisty and spoiled and demanding too! Like an old man who wants to stay on his routine. The vet said most dogs with a lot less problems than Junior has would not be doing what he is doing! Once again, all the glory to God and a huge thanks to K9 Medicinals. I am convinced he would not be doing so well if he were not taking your supplements. They are helping him so much! I know he’s not cured and this won’t last forever. But we are getting the extra time- and good quality time – we hoped and prayed for. Junior is enjoying his life and is pain-free as far as we can tell, which is pretty amazing considering how sick he is. Now that his spleen is OK, we have more time than 2-4 months. The timeframe for his liver cancer alone was 6-8 months and that was 3½ months ago. I guess things could go downhill fast, but as of right now he is showing no signs of even being sick. We are so, so grateful for every day with our sweet man. 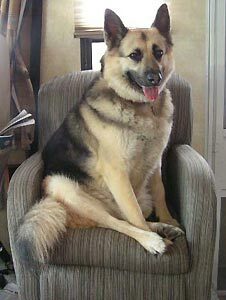 “Our German Shepherd, Zac, developed large enlargements of his lymph nodes. We took him to our vet and he did a biopsy of one of the nodes. The report came back negative for cancer. The swelling did not go down so we took him to a different vet. This time four of the nodes were tested for cancer and all four tested positive for lymphoma. Lesson here: if your dog has lymph node enlargements be sure to get at least, if not all, of the nodes tested. We wasted two weeks or more in getting treatment started by having only one node tested. After consultation with a prominent canine oncologist our vet put Zac on a nineteen week regimen using a modified Wisconsin protocol. He will be finished the first week in February 2010. 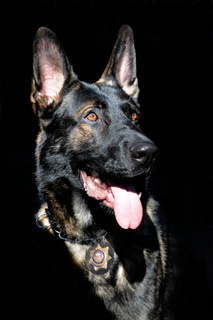 We started him on the K9 Immunity and the K9 Transfer Factor at the beginning of the treatment. Our vet has been amazed at how well Zac has been doing. 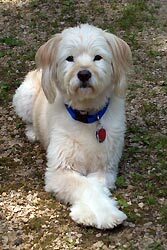 “I just want to thank you for yet another happy day with Ellie, my goldendoodle! 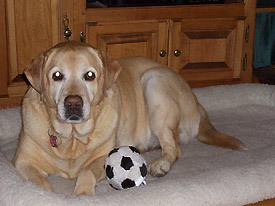 Ellie had an emergency spleenectomy in early March, 2009 and was diagnosed with splenic hemangiosarcoma. One vet told me she could be gone in as little as 6 weeks. I knew there had to be a way to increase the number of our days together! In addition to chemo, I scoured the internet and crafted a cancer care plan for Ellie that includes K9 Immunity, K9 Transfer Factor and K9 Omega. 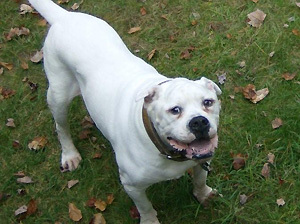 “In the fall of 2008, Boomer began limping a little on his right front leg, but everyone thought it was probably just a strain. When it didn’t heal, however, he was taken to the vet in early December, and after two biopsies, it was confirmed as osteosarcoma or bone cancer…the most aggressive form. I found out about K9 Immunity the same week as Boomer’s surgery to amputate the leg. Faced with a grim prognosis of potentially only a very few weeks to live, I decided to try the K9 Immunity products to see if they lived up to the claims they made. 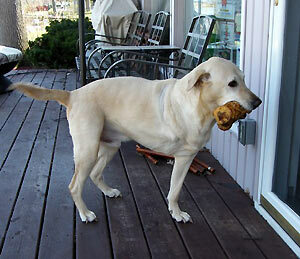 We just wanted to let you know that our yellow Lab, Hannah, is still going strong after 11 months. If you look closely in the picture, you can see the tumor on her left rear leg. They wanted to do chemotherapy and radiation, but we picked quality of life and researched the internet and found you. We changed her diet and added K9 Immunity, K9 Transfer Factor and K9 Omega Fish Oil and the tumor has not grown. Some days she still acts like a pup! UPDATE 7/13/09: Hannah, 19 months plus with cancer and going Strong. Our vet said he has only seen one other dog last so long.